Have you sat beneath a parijata *1 tree? Have you known those sudden showers of gracious blossoms piquantly delicate? The tree knows not of graciousness nor of favours for it simply ‘is’! To think about Sri Vitthal Ramanuja is to be drenched in the shower of such grace! Kinkar *2Vitthal Ramanuja, an adept in spiritual and academic learning, a scholar and great renunciate, well established in celibacy and vow of truth, brings to the world the life and teachings of Naam Avatara, Sri Sitaramdas Omkarnath. He is the present president of the sampradaya *3 founded by the Master. He is not only a close blood relative of Sri Sitaramdas Omkarnath but also linked to him as a companion in religious austerity. Sri Vitthal Ramanuja was born on 1 st of March 1946 in a pious Brahmin family in a small village called Dumurdaha in Bengal. The child was named Ramadayal Chattopadhyaya. He was barely eleven when Sri Sri Sitaramdas Omkarnath accepted him as a dear disciple and initiated him by bestowing diksha. Revered preceptor nevertheless did not forthwith command the child with distinct spiritual dispositions to a life of renunciation; instead he encouraged him to pursue studies. A member of Thakur’s own family, the grandson of his own elder brother poet Bankim Chandra, he knew Sitaramdas Omkarnath right from his childhood as ‘daadu’ (grandfather) – he would call him by that name.He spent his childhood in a family in Raniganj that believed in no other deity than Sitaram. He grew under the shelter of a great teacher (revered professor Sadananda Chakravarti) who was unparalleled not only as a professor of English literature but also as an expert in of Omkarnath philosophy. The literary and the spiritual faculties of the young boy (Bitthu, to the near and dear) flowered under the careful guardianship of this Shiksha Guru in the garb of professor! Obeying the command, the disciple completed his M.A. exam in English from Calcutta University on 8 th of January 1973. The day after, 9 th of January, he renounced home! In the year that Sri Vitthal Ramanuja renounced home and hearth (1973), the Preceptor founded the Akhil Bharat Jai Guru Sampradaya Trust *4 and made Sri Vitthal Ramanuja a member. Thereafter, Sri Vitthal Ramanuja rendered service to Sri Guru while leading the life of an ascetic. Sri Sitaramdas Omkarnath observed, “You have performed extensive spiritual practice in the last life. Your efforts in this life are bound to reach perfection in a short time. You will do significant work to further the welfare of mankind.” Sri Guru named him Kinkar Vitthal Ramanuja. Sri Vitthal Ramanuja performed severe austerities, often taking recourse to mauna *5 and sarvasangatyaga. *6 Such austerities heighten the power of japa *7 or meditation. These were performed while residing in hermitages established by Sri Sitaramdas Omkarnath at Uttar Kashi, Dumurdaha, Rishikesh and Omkareshwar. Among these, Omkar Math at Omkareshwar is very dear to Sri Vitthal Ramanuja. Omkar Math is regarded as the hriday sthal (heart) of Sri Sitaramdas Omkarnath. It was at Omkar Math that Sri Omkarnath had performed austerities in unbroken silence and solitude for twenty-two months at a stretch. On the banks of the holy Ganga River, at Uttar Kashi, the Bhagirathi Math nestles in the foothills of the mighty Himalayas, the ‘Giriraj’ (the king of the mountains). It was the end of the year 1977, the winter had begun, and there was a sharp nip in the air. Sri Vitthal Ramanuja was steeped in meditative practices and austerities at this holy spot. His Preceptor Sitaramdas Omkarnath reached there! He said “I know you are very fond of solitude, you don’t like to go anywhere, which is why I have myself come to you.” Guru and disciple lived in seclusion for six months, in the select and intimate company of a few other renunciate disciples. In the midst of Sadhana (performance of spiritual practices), Samadhi (trance) and Swadhyaya (scriptural study), Sitaram would now and then utter the two words, 'Matar Gange' with deep devotion. (This is an invocation of the holy river, Ganga, as mata or the Supreme Mother). This habitual incantation of the Guru intoned in His sweet, flute-like voice touched a deep chord in the worshipping heart of the disciple. The Guru’s words seemed to plunge into the tumultuous waters of the Ganga touching the very bed of the river, and resound against the Himalayan heart. Enormous and thrilling reverberations in Nature and Man echoed the incantation! Here indeed was a holy confluence of Guru, Giriraj and Ganga! Nature and Man were in meditative peace. Here, in this spot, Sri Vitthal Ramanuja, the scholarly ascetic, was immersed in the study of the Valmiki Ramayana. Contemplating the divine play of his favourite deity Sri Bhagawan Ram, He was overcome with tears, thrill and shivering…symptoms of high yoga. All at once Sri Guru Sitaram flashed in his mind’s eye in the place of the deity. He had reached the pinnacle of spiritual experience. Thus commenced Sri Vitthal Ramanuja’s mastery of scriptures. (Vivek Chudamani 60: Sri Sri Shankaracharya). All the verbal jugglery and the various subtle interpretations of the Scriptures seemed to me to be meant for the recreation of the learned scholars and absolutely immaterial for the soul's emancipation. But the standing instruction of Sri Gurudeva shook the very foundation of his long cherished notion. He returned to studying the Shashtras (Hindu Scriptures) and other books on spiritual matters, with fresh vigour. The fruit thereof was not too late in ripening. He was possessed by a queer devotional ecstasy! In this tumultuous ecstasy, He wrote some hundred pages without a break. Gathering further momentum He wrote another hundred pages or so and faithfully chronicled in fine detail all the significant events of His Preceptor’s life. In these pages, a product of His constant contemplation and literary devotion, Sri Vitthal Ramanuja paid a tribute to his Guru! This work was originally penned and published in Bengali. It bears the most endearing name ‘Navo Navo Rupe Eso’. The meaning of this title is ‘Come in Ever New Forms’. (Today it is available in Hindi, as ‘Chitta Ka Nitya Mahotsava’, and in English, as ‘The Eternal Festival’). In the pages of this text Sri Sri Sitaramdas Omkarnath has incarnated himself in the form of a literary idol. It presents a penetrating analysis of the multifaceted personality of Sri Bhagawan Omkarnath Dev both from the literary and spiritual perspective. Through these narrations, the philosophy of Sri Sri Sitaramdas Omkarnath comes through. There are also more direct expositions of the unique philosophical stand taken by the Preceptor and His followers. Some of the chapters in this text are so powerful as to grant shaktipaat *9 to a prepared soul. The innate literary skill of Sri Vitthal Ramanuja has its hereditary roots in the literary skills of His grandfather, Sri Bankimchandra, and of His father, Sri Vimal Krishna. Sri Bankimchandra was Sri Sri Omkarnath’s elder brother. Respectable critics of the time had praised the literary creations of this relatively unknown rural poet. After the elder brother’s demise in early life, Sri Sri Omkarnath brought up his only son, Vimal Krishna. The young Vimal Krishna had serious misgivings regarding his uncle’s spiritual status. Later he realized and accepted the divine manifestation of Sri Omkarnath, plunged into rigorous austerities to realize God and was among the leaders of His Sampradaya. He edited ‘Devayana’, the first mouthpiece of Sitaram’s religious preaching. He maintained a fond association with Bengali poets and littérateurs and had published some of his poems in literary publications. Sri Vimal Krishna came to be regarded as a singularly interesting personality. It was most natural that his own son, Sri Vitthal Ramanuja, should come forward to compose the memoirs of Sri Sri Omkarnath’s divine life. Deeply impressed with the spiritual perfection of Sri Vitthal Ramanuja as also his dedicated service to Guru, before he merged with the Divine Being, Sitaramdas Omkarnath declared that there’s none to equal Bithu (Sri Vitthal Ramanuja) in the whole world. Kinkar Mahimanandaji was the second President of the Order established by Sri Omkarnath. After his demise in 1990, Sri Vitthal Ramanuja was named the third sarvadhish (President). A life of extensive austerity characterized by mauna, swadhyaya and japa, intimate companionship of Sitaram and a literary prowess refined by higher education– these three virtues of Sri Vitthal Ramanuja’s pure and spotless mind made him the perfect disciple of Omkarnath Dev’s legacy. An expanse of over seventy-five religious centres all over India were a part of the Sangha. Sri Vitthal Ramanuja since then has been involved in a vast array of activities: looking after the hermitages, preaching of Naam (God’s Name), promoting the tenets of Sanatana Dharma, nationwide discourses, singing bhajans and samkirtans, *10 authoring spiritual works and disseminating the supremely sacred life and teachings of Sri Omkarnath. Sri Vitthal Maharaj, as the devotees know him, is an ardent admirer of the great Nobel laureate poet, Rabindranath Tagore. He loves Ravindra Sangeet, *11 as these songs are known. He is a very good singer and has a voice possessing breadth and a transcendental quality. It is a treat to hear Him play the harmonium and sing. 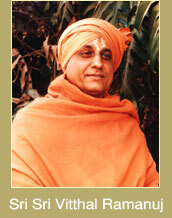 The highlight of His musicianship is His singing of the Naam (Hare Krishna Mahamantra). *12 He has cast the Naam or the Taarak Brahmanaam of sixteen words, in innumerable tunes. He has explored the notes of various ragas *13 by weaving them around the Naam. In these musical outpourings, there are flashes of inspired genius. These flashes are so spontaneous and unpredictable as to escape the untrained ear. His religious music includes works such as ‘Sri Sri Namamrit Lahiri’, ‘Omkargiti Arghya’, ‘Bina Sitaram Kanha Shanti Dham’, ‘Pile Hari Naam Ka Pyala’ (Hare Krishna Mahamantra Samkirtan) and ‘Sitaram Maha Sindhutire’ (Bengali bhajan). Sri Vitthal Ramanuja often addresses gatherings of Baba Omkarnath’s devotees. His discourses carry the weight of serious philosophical import gracefully and lightly. His modesty and directness belie His great scholarship and spiritual attainments. He is averse to gimmicks, verbal or otherwise. He seems determined that the work of the Sangha will be done through the purest means. Sri Gurudeva Omkarnath grants jnanavati diksha *14 or initiation to disciples individually or in groups through him and a very few other worthy spiritual successors. The occasion is a solemn one and signifies a spiritual rebirth for the disciple. Maharajji’s relaxed and casual approach belies the solemnity of the occasion. His simplicity is the result of an aversion to any manner of self-aggrandizement. Alert as to what possibly could be troubling the follower; Sri Sri Thakur will grant even an unspoken request through him. A receptive spiritual aspirant experiences kundalini *15 phenomena on receiving His grace. In ‘A Drop of Nectar’ Sri Sri Sitaramdas Omkarnath says that the realized soul knows that the world is not an object of personal enjoyment; it is there for him to serve. His intimate devotee and successor, Sri Sri Vitthal Ramanuja, epitomizes such attitude. After honing his skills to the maximum, he renounced everything and came to His Guru. Even an ungrateful or recalcitrant student receives generous grace from him. To him the only entity, which is worthy of love, adoration and service, is twin-idol of Sri Guru Sitaram (Bhagawan Omkarnath) and Sri Ishta Dev Sitaram (Bhagawan Ramchandra). He maintains that he himself is unimportant; merely a servant, a subservient, existing to do all kinds of loving service to Gurudeva. He renders all kinds of services to Him with the feeling that ‘I am His servant and He is my Master. He alone is the Master.’ Great is his grasp of kainkarya dharma, *16 he could be described as an ideal in servitude (kainkarya). *1 Parijata: An exquisite flower, seen on earth but famed to grow only in the spiritual world and on the heavenly planets. Defeating the opposition of Indra, Krishna brought a parijata tree from Svargaloka for His wife Satyabhama and planted it in her garden in Dvaraka. *2 Kinkar: A servitor of God. *3 Sampradaya: A school of philosophy or religion. According to the Padma Purana, there are four authorised Vaishnava sampradayas, founded by Lord Brahma, the goddess Lakshmi, Lord Siva, and the four Kumara sages. In Kali-yuga these schools have been reestablished by the acharyas Madhva, Ramanuja, Vishnu Swami, and Nimbarka. The sampradaya of Lord Chaitanya Mahaprabhu is officially connected with the Madhva line, but incorporates teachings of all four sampradayas. *4 Akhil Bharat Jai Guru Sampradaya: Spiritual Order founded by Sri Sitaramdas Omkarnath. *5 Mauna refers to a vow of unbroken silence. *6 Sarvasangatyaga means going into isolated retreat. *7 Japa:“Incantation.” Practice of concentrated repetition of a mantra, often while counting the repetitions on the palm or a mala/ strand of beads. It may be done silently or aloud. It is a part of mantra yoga. *8 Paramatma: God, the Supreme Spirit. *9 Shaktipaat: Shaktipaat denotes the descent or transmission of energy from a more powerful to a less powerful entity. *10 Bhajans and Samkirtans: Singing of God’s praise. Here, the term refers to chanting of Mahamantra 'Hare Krishna Hare Krishna Krishna Krishna Hare Hare, Hare Ram Hare Ram Ram Ram Hare Hare'. *11 Ravindra Sangeet : School of music founded by world-renowned poet Rabindranath Tagore. *12 Mahamantra: The term is used to represent the Tarak Brahma Naam viz. Hare Krishna Hare Krishna Krishna Krishna Hare Hare, Hare Ram Hare Ram Ram Ram Hare Hare. *13 Raga: A traditional melodic type in Hindu music, consisting of a theme that expresses an aspect of religious feeling and sets forth a tonal system on which variations are improvised within a prescribed framework of typical progressions, melodic formulas, and rhythmic patterns. *14 Jnanavati diksha: (Also known as Niradhara Veda diksha or Siddha Yoga) Ordinarily the initiate must work for himself and proceed stage by stage; he is to ascend the stairs himself by virtue of his own effort. Not so with those initiated in the Jnanavati diksha. The essence of this initiation is that the Guru transmits power to the disciple, awakens his kundalini, which begins thereafter to take its own course. The Guru infuses spiritual energy by touch, look or thought and the sleeping kundalini wakes up. *15 Kundalini: Kundalini is derived from a Sanskrit word meaning either coiled up or coiling like a snake. It is a term in yoga, referring to a reservoir of psychic energy at the base of the spine. Kundalini is curled up in the back part of the root chakra in three and one-half turns. *16 Kainkarya dharma: An aspect of sharangati or path of absolute refuge in God. Kainkarya dharma refers to swearing servitude to God.